We released an open source PHP library this week. 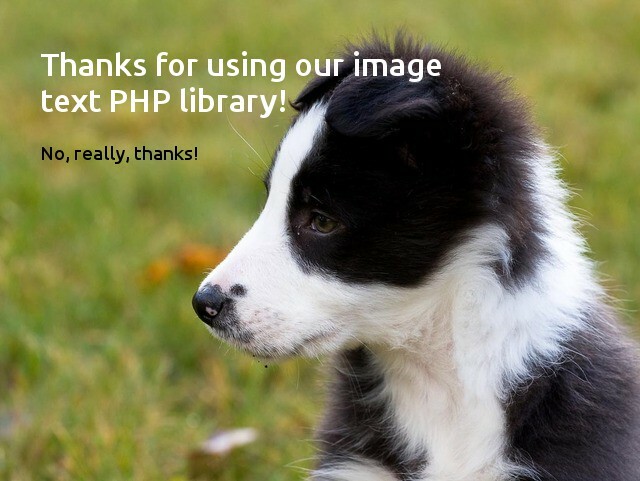 It's called Image with Text and, true to its name, it makes it super easy for you to add text to images with PHP. It's not often we need to add text to an image, but occasionally a client approaches us with a project idea that requires it. For example, we recently built an application that lets friends and family deliver customized e-cards to hospital patients. Each card can be customized with a title, a message, and the name of the sender. The customized card is generated with our Image with Text library, then emailed either to the patient or the nurses desk for printing and hand-delivery. You can use custom fonts, too! Just download a TTF or OTF font (appropriately licensed, of course) and then set the text block's font property to the relative or absolute path of the font file. Both Google Fonts and TypeKit are great places to find fonts. Each text block is assigned exact coordinates to position it on top of the source image. If the text is left or center aligned, the X and Y coordinates are relative to the top left of the source image; if the text is right aligned, the X and Y coordinates are relative to the top right of the source image. The second argument is the maximum number of lines, and the third argument is the maximum number of characters per line. Both of these are optional, and they default to 1 line and 80 characters, respectively. Here's a working example that puts everything together! You'll see that we create an image, add two blocks of text to the image, and render the image with text to a new file on disk. It's nice library, very well done with this! I've also created an article about adding text to an image in PHP I think beginners should understand how this actually works. - The requested package nmcteam/image-with-text 1.0.0 could not be found. You don't have permission to access /image-with-text/example/demo on this server.